Sometimes, I just crave something simple. 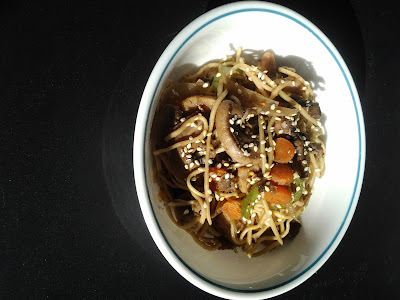 I love chow mein noodles, and the great thing about it is that you can usually add just about any vegetables you have roaming in the fridge and it will still taste good. 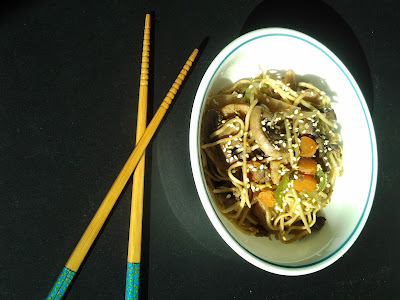 Usually, I like to add more oriental vegetables such as bamboo shoots, water chestnut, shiitake mushrooms, snow peas, baby bok choy...but alas, these are the ingredients I had on hand. Depending on how quickly you can chop, this dish can be ready in under 30 minutes. 1. Slice all vegetables including the garlic above accordingly and begin stir frying in a wok with a little sesame oil. Stir fry on medium high heat until cooked but still crispy. 2.In a separate pot, boil water and cook chow mein noodles for 2-3 minutes max. 3. Add noodles to wok along with the rest of the ingredients and cook for another min or 2 until the noodles have absorbed some of the flavour. Serve with sesame seeds on top and green tea. Have you had chow mein before? Posted by Scrumptious Vegan at 3:03 p.m.